Jeremy E. McDonald: Leaders: Who Will Tell You the Truth About You? 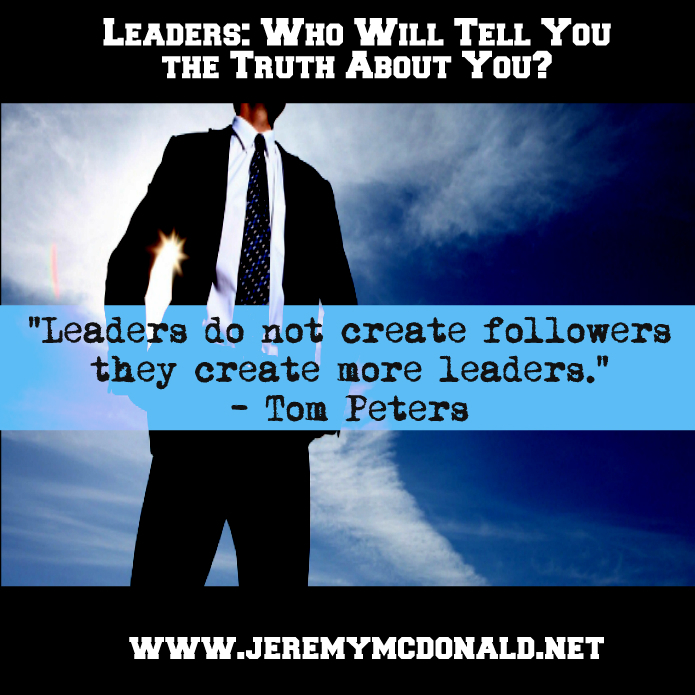 Leaders: Who Will Tell You the Truth About You? Leadership is a role that all of us fall into at some point or another. We at many times in our life have others looking to us for answers or guidance. So who helps us grow? and who holds us accountable for our actions? I have found by giving people permission to always speak there mind with me; I have gained a great team that will speak up when need be so I can grow as well. Take a looks below and use these tools as a way to become self aware! When Katie was referred to me by the CEO of her organization, I was immediately aware of her presence. And by the end of our first coaching conversation it was clear she had a lot of talent. It was no wonder she was seen as one of their "best and brightest" young leaders. In our second session we explored where she might be developmentally challenged. The truth is she was living a charmed life thus far in her career. So we turned our attention to her future. Our next meeting began with what I like to call "the truth talk." It always begins with some recently newsworthy story of a fallen leader. To make it more relevant, I opted for a female leader in her organization who had been ousted after making some very poorly considered remarks that were publicly cited. She contemplated the question for a few moments before she spoke. "Bad judgment," she stated with simplicity and clarity. "And why might that be?" I prodded further. I could immediately see this root cause question was stretching her. "Poor advice?" Katie guessed, then chuckled at herself. I laughed with her. "That sounded tentative, which is just fine. But let's look further to the root causes. Why would she receive questionable advice?" "Logically it was either because Joanna did not have good advisers, or they weren't willing to provide the advice." Katie smiled. "Or... she didn't ask." She could see me getting ready to prod her again so she quickly added, "Or she couldn't hear it." I nodded with appreciation to validate the clarity of her thinking. Then I took it one step further toward understanding. "Katie, all of those are right on the mark in terms of possibilities. And over many years I have studied this problem in all kinds of leaders. Over and over again I find that for countless reasons leaders run amok because they do not have someone who can and will tell them the truth about themselves; someone who they trust well enough that the leader will actually listen." She looked up to nod before returning to furious note taking. "In his book, How the Mighty Fall, Jim Collins determines that very talented and successful people often fail badly because of a loss of humility. Hubris he calls it. As a result of their successes and the inevitable rewards, they forget themselves." I could see the point hitting deeply within her as she pursed her lips in concentration. "They begin to believe their own press," Katie affirmed. "Yes," I replied, "And they do not know when it happens because of the subtle machinations of the ego and its operation beneath the surface of our awareness. Now do you see the problem Joanna faced in a different light?" "Definitely! I can see it so clearly." She paused before assimilating her insight. "That's the story of a lot of leaders, isn't it?" I took a deep breath before I responded. "Yes. Exactly. And unfortunately it can be your story as well." Katie was suddenly stock-still as she eyed me. "So the only question I want us to explore is how you will ensure you have someone in your life who can and will ground you in your own humility and humanity. Okay?" Katie blinked as she digested it. "Okay," she replied with conviction. It is a great challenge to see ourselves truly for who we are, and who we are not; and for what we can do, and what we cannot. The challenge only grows with success or acclaim. Without being grounded in the truth of ourselves, our potential is unlikely to be realized or sustained. A few key questions may be helpful in a self-assessment. Probably this alone will be sufficient to spur us forward toward our own growth and development. When is the last time I actively sought feedback when the possibilities made me uncomfortable? To whom can I regular disclose myself? Is there evidence they can and will tell me the truth? When it really matters, do I seek people to affirm me? Or to ground me? How often do I hear feedback that causes me to change my perception or actions? The Number 12 in Mythology and Spirituality - Religion - Why so evident in many things? 10 Levels of Consciousness – Which One Are You At?